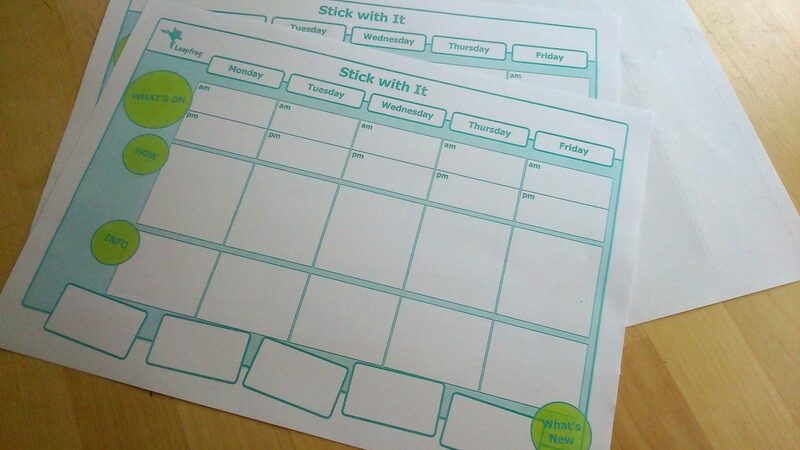 The Stick With It tool helps to connect people with activities and groups that are right for them. It helps to discuss any concerns they may have about taking part in activities (such as how to get there), and then come up with practical ways and recommendations to overcome these concerns. The key objective is to develop a plan of action that covers the people and supports that will be in place for them, which can be kept and pinned up on the wall or on the fridge to refer back to. The aim of the tool is to give the person a sense of reassurance and confidence, knowing that future plans have been considered and are in place. Stick With It was co-​designed and tested with social enterprises and key workers in Moray working to tackle isolation and loneliness, aiming to connect people with social activities. With this tool you can add weekly activities to a callendar along with details of ‘how’ a person will attend an activity and the ‘info’ they can rely on to help them. The blank sheet can be filled in by family, friends, or key workers to help people find and connect with social opportunities.